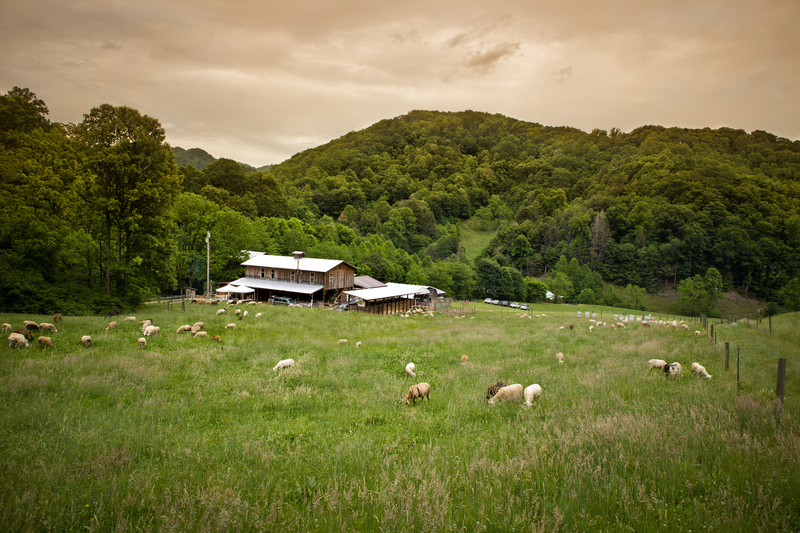 East Fork Farm is a forty acre family run farm that specializes in raising healthy meats using sustainable practices. On the farm, we have grassfed lamb, beef and pork, pastured poultry for meat and eggs, farm raised rabbits, pond raised trout, and have a gristmill to grind corn. We sell at the North Asheville Tailgate Market and at our farm store. We have been farming for twenty years and currently have one apprentice positions available for 2018. We offer duck, chicken, turkey, lamb, beef, and pork meat, as well as duck and chicken eggs. We host workshops and farm tours, as well as renting event space and offering B&B services. We sell at the North Asheville Tailgate Market and at our farm store. We are looking for TWO apprentices to start in March and continue through November. Our general work week involves moving, feeding and watering all the farm critters, processing poultry/rabbits/trout and packaging, pasture rotating animals (poultry, cows, sheep, pigs), fence mending, touring guests, cleaning barns, collecting eggs, attending tailgate market, corn operations (harvesting, shucking, shelling, grinding and packing), tending our garden, canning and cleaning cottages. We have a weekly farm tour with Asheville Farm To Table Tours and we host a couple of paid events on our farm each year. Position includes housing and $400 a month stipend. Stipend increases $25 each month. Housing: We provide housing for our farm help in an apartment constructed in the top floor of our barn complete with a full kitchen, outdoor bathroom and privacy curtains around each bedroom. The living quarters are approximately 900 square feet. Food: Farm help is responsible for providing all of their own meals with access to large kitchen garden, stone-ground corn, meat seconds, and eggs. Bulk items that we purchase will also be available. For example; flour, rice, olive oil, salt, apples, etc. We will eat lunch together once a week to sit down and discuss the happenings on the farm and for some more classroom learning. Our farm is a very active member in the CRAFT network. This is an extremely valuable educational and networking opportunity for apprentices and farmers alike. We are in the beautiful mountains of western North Carolina and only 30 minutes from Asheville and 20 minutes from Marshall. There is a ton of wonderful outdoor activities to participate in right near the farm like mountain biking, hiking and paddling. We ask that all applicants be interested in farming, have the ability to work consistently on repetitive tasks, be in good physical and mental shape, enjoy physical labor and have a positive attitude. We hope that all farm help will be able to have fun and stay focused while working hard. Successful applicants will have former farming experience and the ability to take directions and show initiative. To inquire about employment opportunities, please contact us by phone during the day or by email between November and April or visit our website for further information. “Really good people to work for and learn from. I will be leasing land to farm just a mile down the road if that tells you anything. One thing I wish I was more mentally prepared for was the agritourism involved with the rental cottages. If you don't like talking to people and can't stand to make a few beds then I'd be concerned. Our farm is open to our visiting cottage guests. We do not allow "drop-in" visitors, but do allow people to shop at our farm store, open daily. We have a weekly farm tour with Asheville Farm To Table Tours and we host a couple of paid events on our farm each year.